This San Diego vacation residence has a spectacular landscape view of the ocean, but evidence of the owners’ personal style could not be found in the home’s lifeless and outdated design. 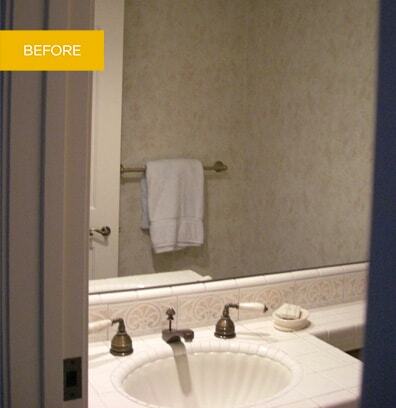 The home’s original low profile powder room had a monochromatic color scheme that blended into the hallway. The clients decided to transform the powder room as the first custom designed space as they planned a whole home remodel. The powder room’s bland color scheme, traditional fixtures and outdated materials were out of sync with the fun and eclectic personalities of the homeowners. Our design team transformed the powder room with a wall tiled top to bottom with an undulating mosaic, a bold single door cabinet with modern hardware, and shelves for displaying the clients’ collection of abstract artwork. The new powder room’s only reference to its past is the location of the plumbing fixtures and vanity. Striking blue walls, rich walnut engineered-wood flooring, and glowing orange glass tile inserts complete an artistic and memorable impression. Suddenly an independent space of interest in the home, visitors take the time to appreciate all of the intricate design details. 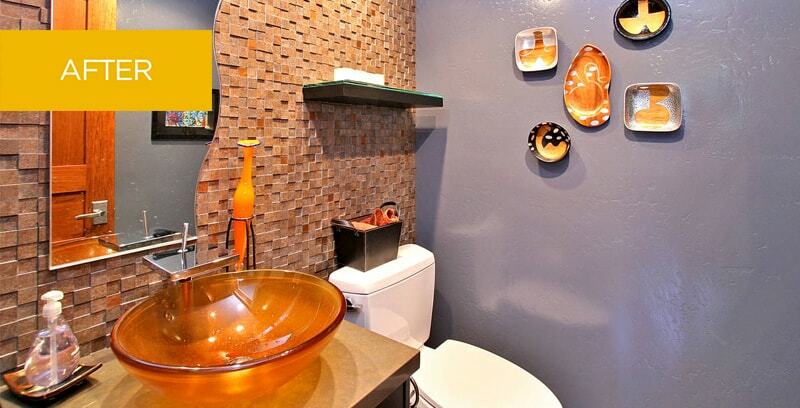 The new powder room is now a playful and vibrant combination of textures, colors, and shapes. The clients consider their new powder room design a work of art in itself!